I love bags and I love fabric. My hubby has now told me that I can't buy a handbag unless I get rid of one. OMG, who does this? Don't we just continue to collect them and trade them out with our various outfits? They never wear out, so they just accumulate in the back of the closet. So occassionally I'll just sneak one in and just say I've had it forever but don't carry it that often. I wonder if he is on to me yet... oh well, so far so good. Well back to bags and fabric. 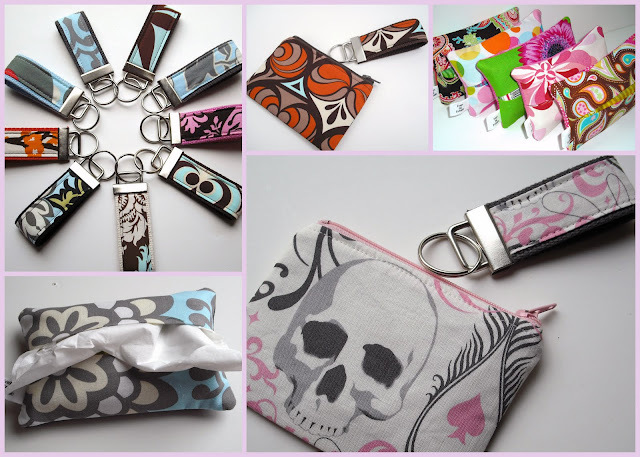 This fellow blogger and creative soul has some wonderfully colorful bags, key flobs and pouches. She uses some amazing fabric prints for her designs and if you want to buy in bulk, she has listings for that also. I think my favorite is the bright pink flower tissue cover. I've seen these before, but I don't own one..humm I wonder why? I do carry tissues in that plastic baggy thing they come in, but I guess I have never thought about purchasing one for myself. I do agree with Melanie that they would make great gifts when you just need a little something. Check out Melanie's blog and her Etsy shop for more great items.